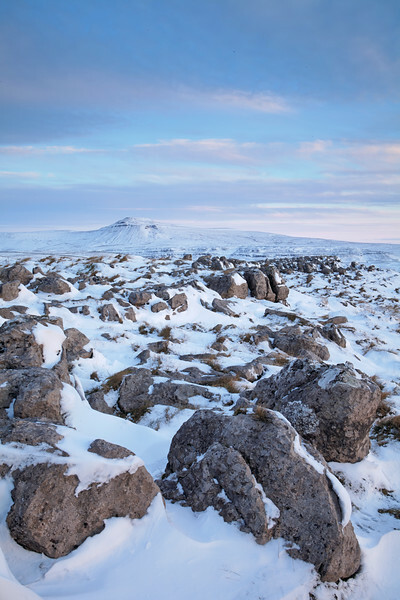 Winter in the Yorkshire Dales where snow and ice covers the landscape. The glow of the setting sun lights the cloud and snow with a pink glow. 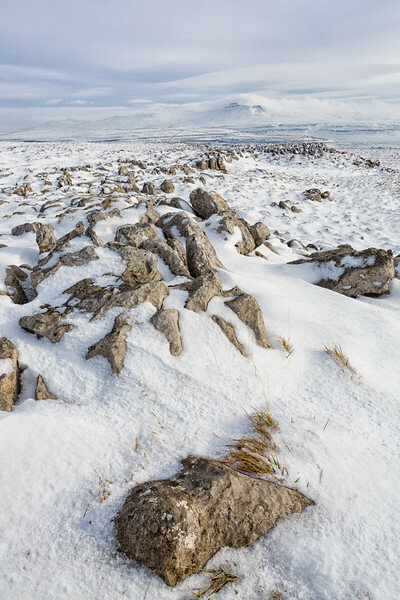 The edge of a limestone pavement, Kingsdale, with a dusting of winter snow. 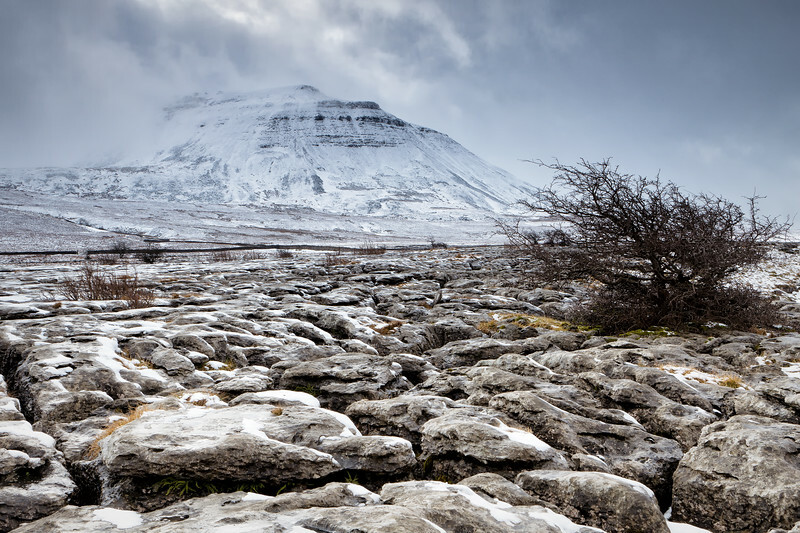 Above the twisted hawthorn tree on Southerscales limestone pavements, passing storm clouds reveal the upper slopes of Ingleborough, Yorkshire Dales, England. 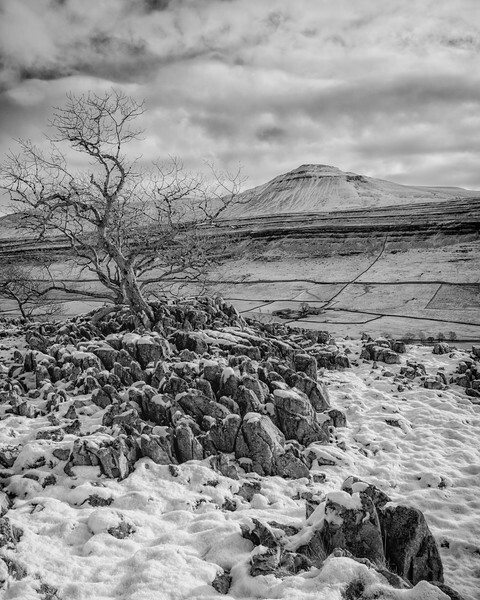 From above Twisleton Scars, a solitary ash tree sit amongst the limestone. 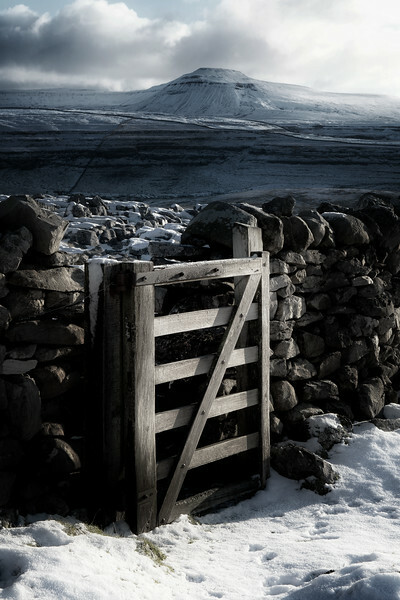 Across the valley, ice covered Ingleborough with a light shroud of mist catches the low winter sun. Yorkshire Dales, England. 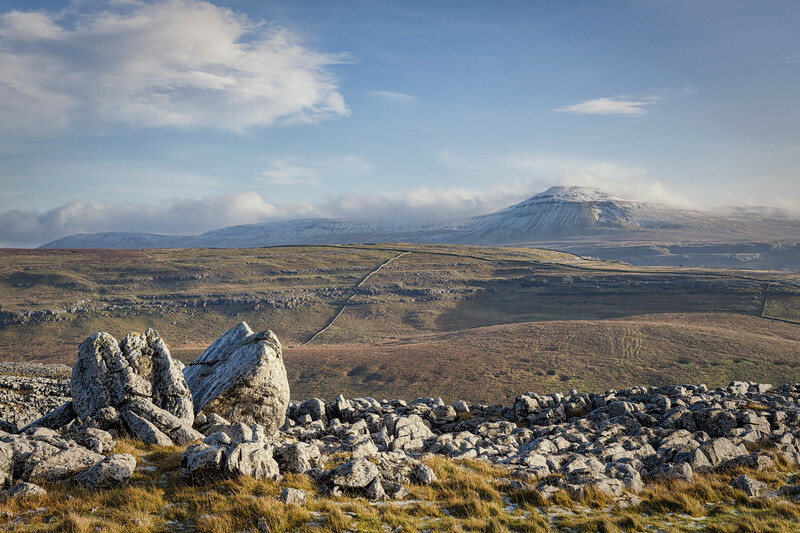 Ingleborough, with a light dusting of snow, watches over three limestone rocks as they balance on top of an exposed piece of limestone pavement. 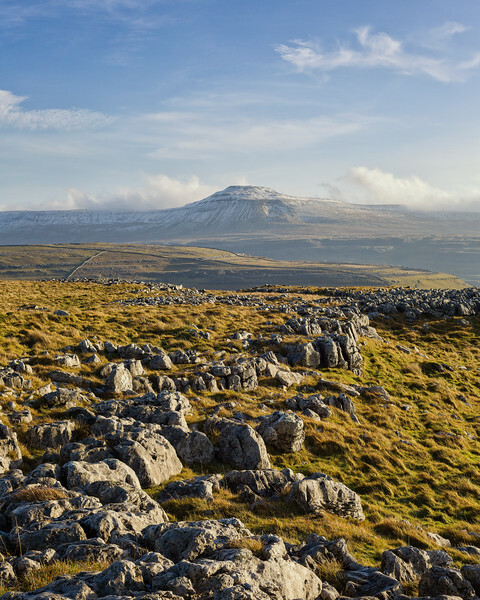 Deposited when glaciers retreated from these valleys at the end of the last ice age, Yorkshire Dales, England. 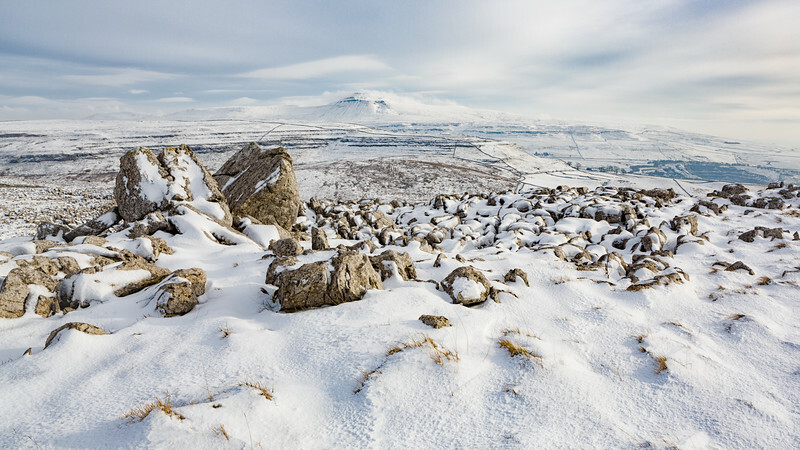 A distant Ingleborough with a dusting of winter snow. 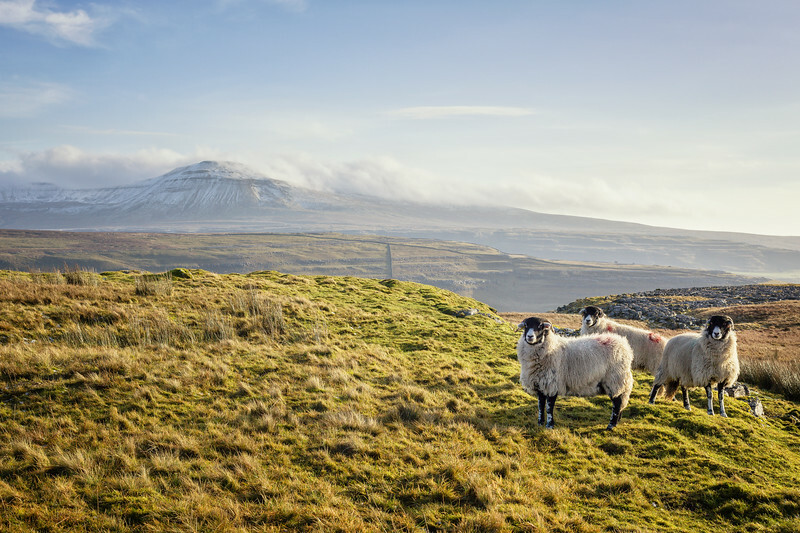 Three hardy swaledale sheep, a local breed, at home in Kingdale, with snow covered Ingleborough beyond, Yorkshire Dales, England. 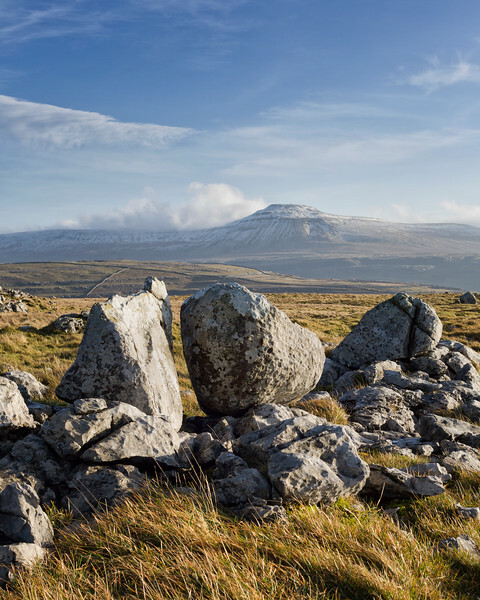 Deposited as the glaciers retreated at the end of the last ice age, some 10,000 years ago, a large limestone boulder sits near the edge looking across Kingsdale towards Twisleton and Ingleborough. Yorkshire Dales, England. 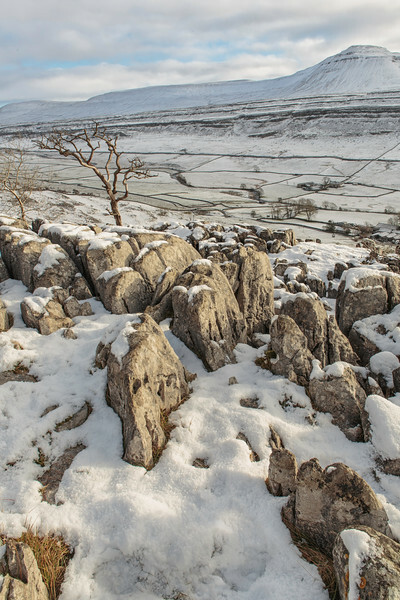 Limestone rocks split by years exposed to the harsh weather of the Yorkshire Dales, England. 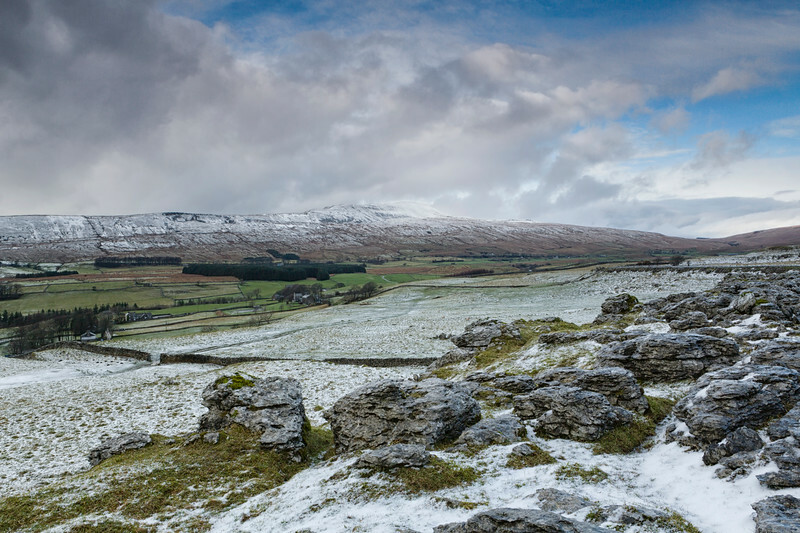 From the edge of the limestone pavements of Southerscales, looking across Chapel-le-Dale towards Whernside. Yorkshire Dales, England. Roots clinging to the limestone a tree stands dormant awaiting the warmer weather of spring. Yorkshire Dales, England. 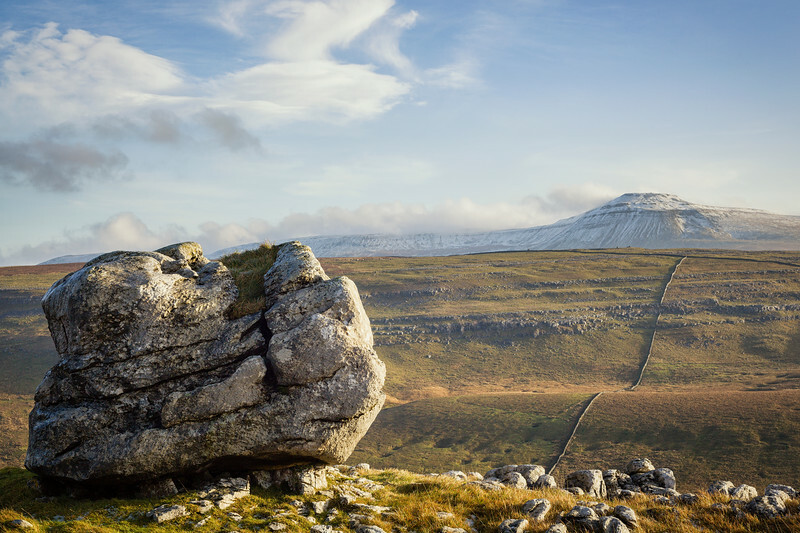 The edge of Twisleton scars looking across Chapel-le-Dale towards Ingleborough, Yorkshire Dales, England. 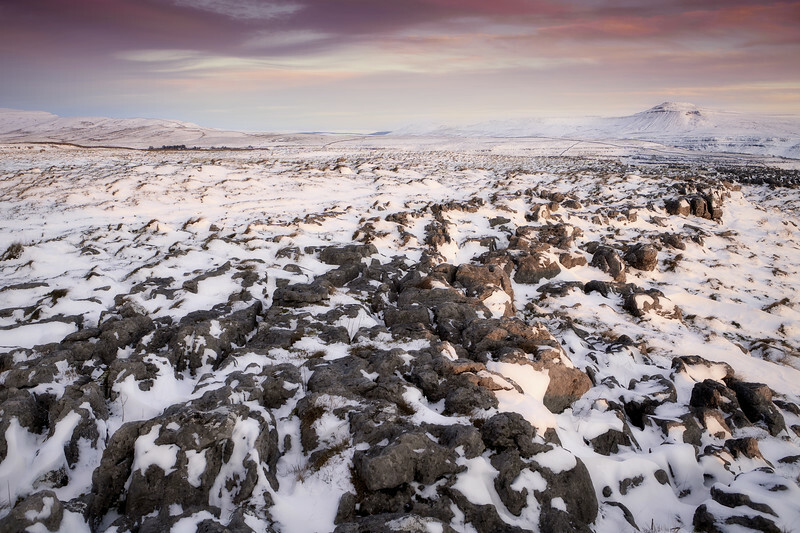 Fresh winter snow covers the tussock and limestone pavements on Twisleton Scars, Yorkshire Dales, England. 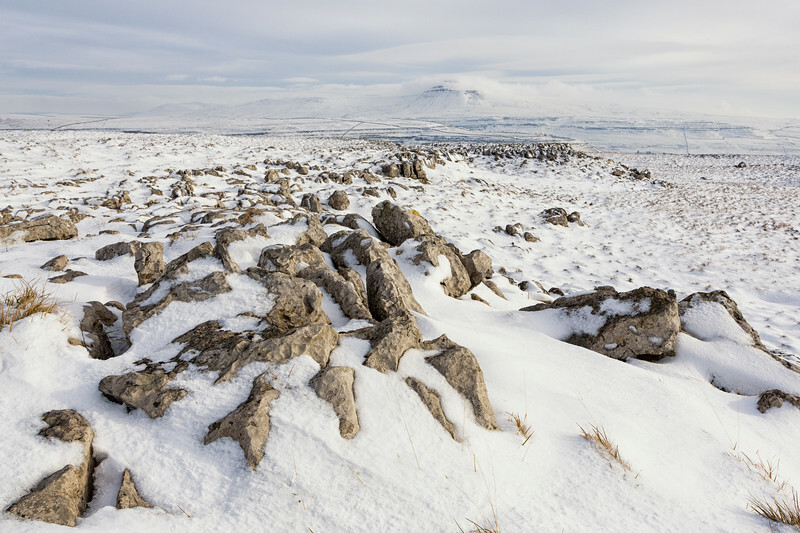 An edge of a bed of limestone stands out against the snow covered tussock, Kingsdale, Yorkshire Dales, England. 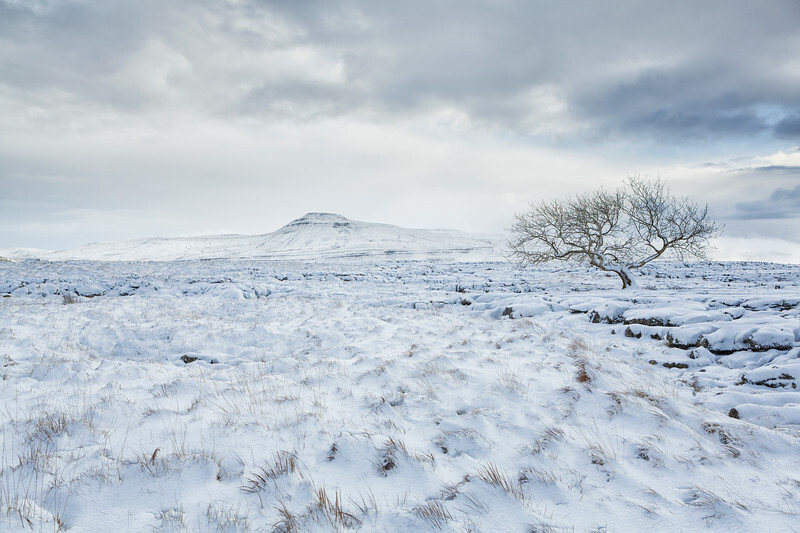 A windswept edge of a bed of limestone stands out against the snow covered tussock, Kingsdale, Yorkshire Dales, England. 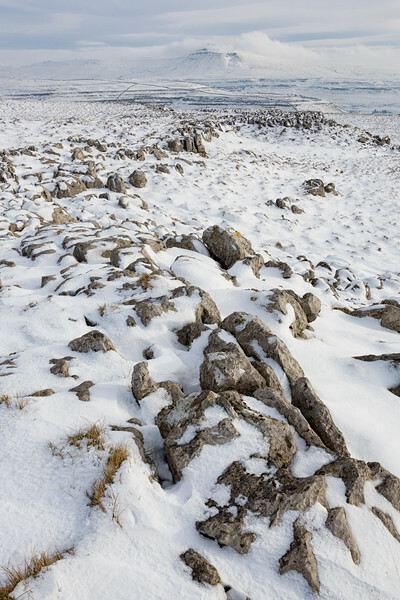 Snow covered limestone rocks split by years exposed to the harsh weather of the Yorkshire Dales, England.